Pay your PTO annual membership dues, PTC scholarship donations, and order your Spiritwear and Pretzel Day as well as sign up to volunteer. If you want to order, you must create an account and order on-line. There will be no paper order forms sent home. You must sign up by September 14th. This date WILL NOT be extended! To use the on-line ordering system, please go to http://www.ptobay.com. In the upper right corner, you must select "sign up." Follow the instructions for "sign up for a new account." Once you have created an account, click on "orders." You will need to add each child’s name to the account under "Tools: Add Child." Continue following the step-by-step instructions to add each child to your account. • Choose your child's home room "K: Teacher Name - AM or PM session"
• Once your child has been added to the account, you can begin to order. 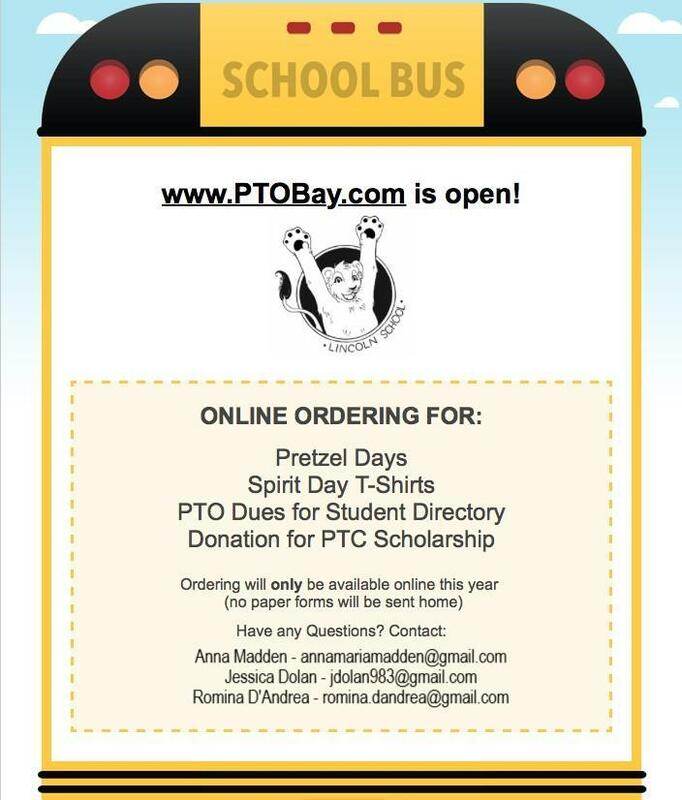 • Click the rectangle box "PTO Bay Membership Dues, Philly Pretzel, and T-shirts 2018"
• Scroll down and choose quantity, click next, until you reach the end of the order options. • The total for all orders will be listed on the payment page. 3. Check sent in to the school office made out to “Lincoln School PTO”. You can send in one check for the total amount.